Size Ladies - Medium Case Material Stainless Steel Dial Color White Bracelet/Strap Ceramic & Steel Polished Clasp Type Double Locking Foldover Clasp Movement Quartz Chronograph Screw Down Crown Yes Bezel Uni-Directional Rotating Crystal Scratch Resistant Sapphire Case Back Solid Water Resistant 200m/660ft Case Diameter 41mm Case Thickness 12.5mm Tag Heuer cah1211.ba0863 Complete Details: Stainless Steel Case. Stainless Steel and White Ceramic Bracelet. White unidirectional turning bezel. White dial with 12 diamond hour markers. Date displayed between the 4 and 5 o'clock position. Quartz movement with Chronograph/Stop-Watch Functions. 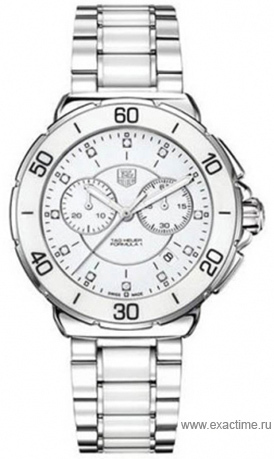 Есть вопросы по Tag Heuer CAH1211.BA0863 Formula 1 Chronograph?